At the Voss Inn Bed and Breakfast you can relax in cozy surroundings and enjoy a style of gracious living reminiscent of an earlier time. 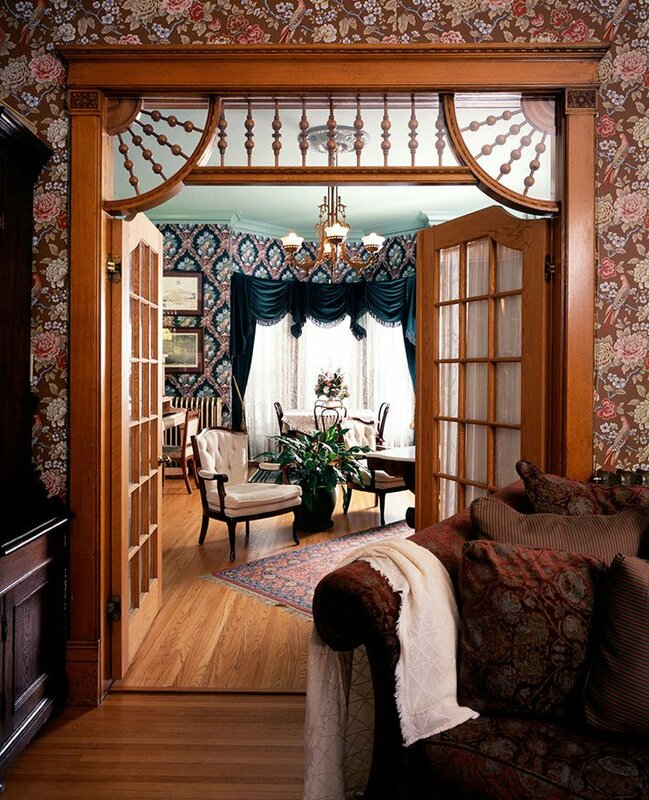 Our Bozeman MT bed and breakfast inn is furnished entirely with period antiques in a comfortable and spacious Victorian style. Adjoining the Victorian Parlor is our gift shop, Artwork of Africa. Browse through the large selection of original artwork and handicrafts, including paintings, sculpture, baskets, textiles and linens imported from Africa. Also available is a selection of specialty products such as our freshly baked granola or our rich, custom-roasted coffee. Our Bozeman accommodation's decor features intricately carved oak woodwork and stained and leaded glass windows from the 1880s. The bed and breakfast inn’s original hardwood floors are accented with beautiful oriental and Persian rugs. The Victorian parlor on the first floor of our Bozeman Inn offers you the opportunity to relax and get acquainted with the innkeepers as well as the other guests. A traditional afternoon tea is served daily. Relax and read a good book, watch television, play our turn of the century upright piano or simply enjoy good conversation with new friends in an atmosphere of gracious living! The inn’s historic charm is complemented by modern amenities such as free high-speed wireless internet, televisions and air conditioning. Stroll through our magnificent English cottage garden, the Victorian rose garden, or the Rocky Mountain native xeriscape that surrounds the property. Or simply lounge on our spacious front porch overlooking the gardens and sip some tea and watch Bozeman, MT go about its daily life. Located in the heart of Bozeman’s Bon Ton historical district, Voss Inn is just three blocks from downtown and walking distance from the best restaurants, shops and galleries. Montana State University is also within walking distance. The Museum of the Rockies is one mile. Complete your Montana vacation with a trip to nearby are Yellowstone National Park, Bozeman Hot Springs and Bridger Bowl Ski Area.